An Oil and Grease removal system to reduce high strength wastewater was installed at Bel Brands USA spreadable cheese plant in Little Chute, WI. Using two 15,000 gallon Crest Precast Concrete interceptors manufactured with Xypex 1000 admixture and coated with Wasser MC tar for PH protection. 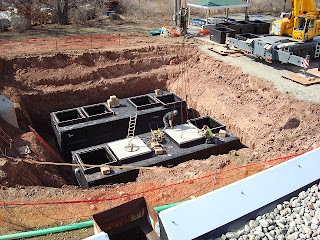 These tanks also have large 5' x 5' hatch doors installed to facilitate pumping and are furnished with a Simtech tru-core inspection system. Each tank weight was at 98,000 pounds and precast ballast tie downs where also installed. The system was designed by McMahon Engineers of Neenah WI. 1-262-246-7181. The Engineer concluded after bench testing the gravity separators by Crest would perform and be installed at a 44% of the cost of an induced air floatation system. The gravity system also has a lower operating cost which?removes 88% of the oil and grease and 65% of the TSS. The Village of Little Chute limits oil and grease to 100 mg/L and these tanks receive an average of 25,000 gallons per day during production.